My first memory of quilting does not involve a needle, thread or fabric. What I do remember is playing with my dolls, sitting under a full-size quilting frame, listening to my grandma and her friends talk as they all sat quilting around that frame. When I was old enough, Grandma started my quilting lessons. Sitting on phone books for height, I would put stitches in and she would make me take them out. She called them “toe catchers.” My stitches are a little smaller these days, thanks to Grandma. Grandma also cut her fabric with scissors using cardboard templates from cereal boxes. I wish she could see what we have now! She’d probably call it all new-fangled. I’ve been a grandma for 11+ years now. 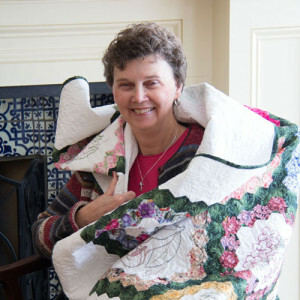 So quilting has been a part of my life for many years. However, “Flowers in My Garden” is my first pattern. I have to say that the whole process took way longer than anticipated. But, the end result was worth it. I am so excited to have you check it out, along with the other goodies on my site. P.S. You might be wondering about the name: THE QUILTED TRAIN. My husband is in love with model railroads. I love quilting. Put them together, and what do you get?